Circumhorizontal arcs—known as fire rainbows—occur if the sun is high in the sky and the clouds are filled with hexagonal ice particles. This fiery natural phenomenon typically forms in wispy cirrus clouds at high altitudes. You can see one only if the sun is at least 57.8 degrees, or ideally 67.9 degrees, above the horizon around noon. This means you can’t see one in mid-winter, and it also means latitude is a key factor; the further north you are, the less likely you will happen to see one. For example, Houston, Texas, has sufficient sun elevation for seeing fire rainbows 745 hours a year, compared to Paris, which only has 230 hours. Further north, in Copenhagen, Denmark (+ 55°N), it is impossible to see one unless at high altitudes, such as on a mountain. So what creates this wonderful natural phenomenon? Two factors converge: a high sun elevation, and the presence of ice particles in the upper troposphere (a layer of the Earth’s atmosphere). The crystals must, however, be of a specific form. They can’t be triangular. They can’t be in many of the common shapes—such as umbrella, bullet, arrowhead, needle, or stellar. And they can’t be tilted. They must be plate-shaped, hexagonal ice particles, positioned horizontally. This is the essential ingredient for a fire rainbow. The sunlight pierces the sides of the ice particle and leaves through the base, thereby creating a multicolored prisma effect. The path of light through a plate-shaped, hexagonal ice particle to create a fire rainbow. Typically, a fire rainbow is centered below the sun as a horizontal line with streaks of red on top. The line moves up in the sky with the sun and it’s colors intensify around noon. Since cirrus clouds are made up of strands or wisps of dispersed bits of clouds, for lack of cloud surface it is rare to see the full spectrum of colors. 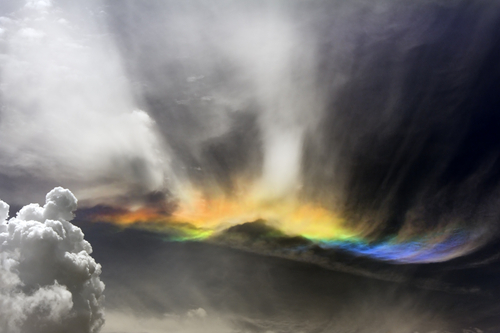 Though they appear as fiery rainbow-colored clouds, fire rainbows are not actually rainbows, and they are formed by ice, not fire. You can calculate your chances of seeing a fire rainbow based on your location here. *Image of a fire rainbow via Shutterstock. *Second image of a fire rainbow via Shutterstock.